This is the second post in a series about choosing violin teachers. 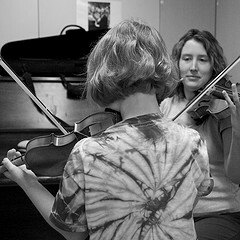 Read the first post, How to Choose a Violin Teacher, here. If you have already been working with a teacher, ask them the questions from that post that you don’t already know the answers to. See what their score is, and then take the following into consideration. Again, 14 points possible. If your teacher scores a 10 or better, you’ve got a keeper! Follow up and consistency are very important. If it was a good idea last week, then it should still be a good idea this week! Many teachers teach from home, but the interruptions should be minimal. Life happens, but you know what is reasonable and what is excessive. Uh OH! Mine scored a 4!!!!! Only teacher fin a 50 mile radius! LOL Judy…well, that’s why you are here browsing, and why you signed up for Suzuki Book 1! Thanks for this! My kids’ violin teacher here in Santa Cruz, Bolivia gets a 13! Really! It’s a very revealing quiz….and I try to keep it in mind as I teach….in case my students get hold of this! 🙂 You might consider which factors your teacher may have the power to improve upon, and gently lead a discussion into those areas, making requests of certain things. Unfortunately, it is very easy to offend teachers (we do get defensive easily…) so discretion and subtlety goes a long way! Good Luck Sara!